The reappearance of bowsprits on fast, up-market boats has influenced the demand for this advantageous spar. 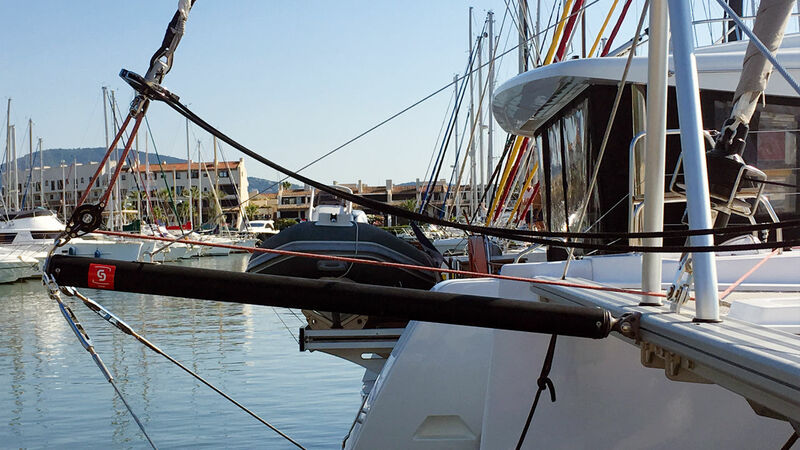 On this one, fixed and in carbon, a genoa and a 180m² gennaker are attached! On production boats, the bowsprit is more often than not in aluminum, and the sail often remains in place during the cruise. A strop fixed to the crossbeam martingale allows the vertical tension to be adjusted and thus its longitudinal axis. This bowsprit is directly incorporated into the forward crossbeam. 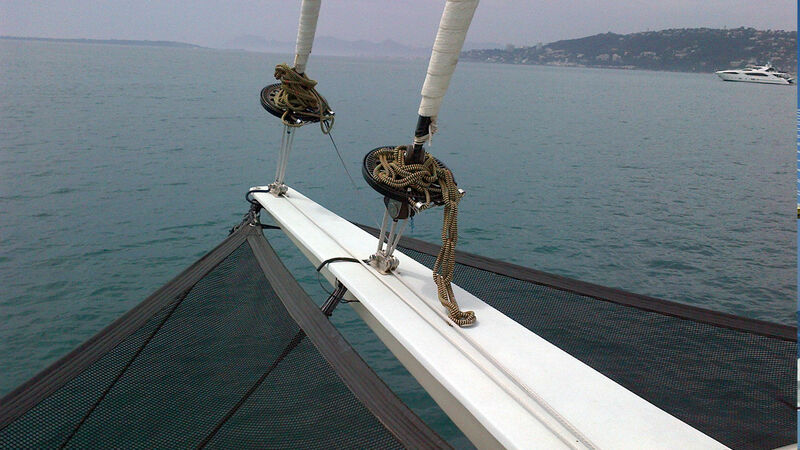 Its fittings allow a sail on a furler to be rigged, and the line which passes inside serves to adjust the height of the tack of the asymmetric spinnaker. Certain models are made to measure. This one, triangle-shaped, allows the compression forces on the forward crossbeam to be better spread. It also helps when rigging the sails, as you can walk on it. The bowsprit can get in the way once you have arrived in port. This one is fitted on a pivot, which allows it to be lifted and folded away, as long as the bobstays can be adjusted, so it can lift. Made-to-measure, up-market models in carbon exist, from certain specialists. They are fitted as an extension of a beam taking the compression from the nacelle, so that bigger sail areas can be used. This model, in high-tech carbon is a little technological wonder, which requires a sophisticated installation. It is retractable and incorporates some very compact hydraulic furlers in the tube! The production builders, such as here Fountaine Pajot, don’t hesitate to offer this equipment as standard, as it has so many advantages. While they monopolized the bows of every ship at the end of the 19th and the beginning of the 20th century, this spar disappeared little by little as time went by, before returning in large numbers in the last twenty years. On our cruising multihulls, it reappeared at first aboard fast boats, where it allowed the center of effort of the headsails to be moved forward. But the geometry of recent sail plans justifies its use again on the most placid production cruisers. In general, genoas have lost much of their overlap, so as to make tacking easier. They have even sometimes become self-tacking. But even when the mast has been moved aft – as on certain very recent models – when sailing off the wind, on a broad or beam reach, they are no longer powerful enough. A gennaker or code D becomes essential, to keep up a good average speed. But if this powerful sail is rolled up just in front of the leading edge of the genoa (which is most often the case, remember we are on a cruising boat!) it greatly disrupts the air flow at the luff, drastically reducing the sail’s efficiency. And equally when the genoa is rolled up, it disrupts the gennaker. Finally, rolling these sails can be hampered if they are too close, not to mention during gybes when the chafing on the genoa can quite simply cause the maneuver to fail. The simplest solution therefore consists of moving the tacks of these sails further apart, thanks to… a bowsprit. And the advantages are then numerous. Firstly, the area of the downwind sails can be increased especially as the foot is going to be longer. Then, the sails no longer get in each other’s way and the air flow is completely laminar. But we can also have them working together, which is very effective on a reach as it creates a venturi effect between the two. Finally, for points of sailing further off the wind, the bowsprit has the effect of distancing the leading edge of the asymmetric spinnaker and allows you to easily sail ten degrees further downwind, compared to a spinnaker attached to the forward crossbeam. You can thus easily sail at up to 150-155 degrees to the apparent wind. As for the maneuvers, the fluidity is much greater and the clearance between the sails avoids wrapping the spinnaker round the genoa. Thanks to the bowsprit and bigger, better-performing headsails, sailing downwind and/or in light breezes becomes fun and resorting to the engines is delayed.